Like us on facebook for up to date deals! Guerrero Bajos have always been a trusted name in Conjunto and Tejano music! 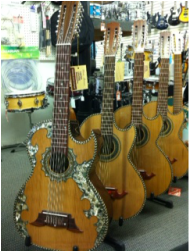 Handmade in Mexico, these instruments are made to meet the demanding standards that artists have come to expect! Paracho Elite bajo sextos are excellent bajos for the musician on a budget! Like the Guerrero bajo sextos, Paracho Elite bajos are also created in Paracho, Mexico. All bajo sextos are unique, and one of a kind, so please contact us for more information on colors, styles, and availability. Bajos come in many different designs to meet your taste! This Paracho Elite has a thin body and is more suited to amplifying with a pick-up (sold separately). Pictured below is the side view of the same instrument. Our selection is always changing so come by often to check them out!